Imagine if editing a document were as easy as arranging building blocks. Need to reorder table rows? Move a task to the top of the list? Reorganize paragraphs? Today we have released an all drag-and-drop editor for Nuclino that will make cutting and pasting a thing of the past. So what can you drag-and-drop? 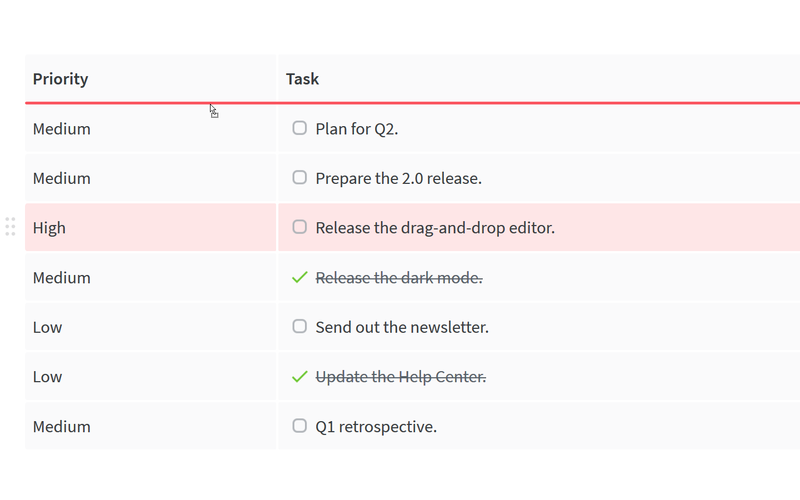 We wanted to make the editing experience as effortless and intuitive as possible, and when we first released the drag-and-drop feature for task and item lists a few months ago, we were just getting started. Now, each block of content works like a Lego piece that can be picked up and placed anywhere in the document – hover over any element and a drag handle will appear to its left. Then simply drag the content block to the desired location indicated by the red line. Deleting content blocks has become easier as well – just click on the drag handle to select an element and hit delete.